When joining a martial arts school, it is best to be careful and to do your homework, so you don’t spend your time, effort and money in vain. In the world of martial arts, all schools are not equal. In the East, authentic martial arts lineages are strongly guarded and respected. In the United States, however, martial arts teachers do not have to answer to any state or federal regulatory commission or licensing agency, and there are no consumer groups to ensure the quality of instruction. In fact, anyone can open a business, purchase a black belt, rent studio space and appear, to the unwitting public, to be a nationally acclaimed martial artist. Unfortunately, many first-time martial arts students and some veteran students have a difficult time seeing past the price tag or the convenience of location, when choosing a martial arts school. These should not, however, be the primary factors when deciding on a school. The most important consideration when looking for a martial arts school is the quality of the instruction—the instructor and the style. If a school is headed by a well respected, traditional martial arts master, generally speaking, it will be a good school. Authentic, traditional martial arts styles date back hundreds of years, and the techniques are “tried and true”—i.e., they work in “real situations.” Over the centuries, lives have been risked (and even lost) in perfecting the methods and techniques handed-down in these authentic traditional styles. One word of caution, however—many martial arts instructors will claim to teach a traditional style, because they know it will help to attract new students. Be sure to ask if they hold a valid rank card or certificate to teach from an authentic master in that style. Many instructors may seem to “know the moves,” and it is not always easy for the untrained eye to know the difference between an authentic teacher, who has a deep understanding of the art, and an instructor who has superficially learned the moves without true understanding of what they represent. It’s somewhat similar to looking at a masterpiece painting and an imitation of that painting. 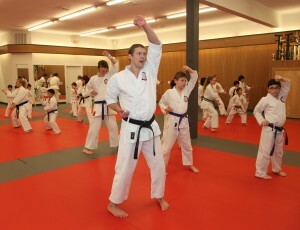 The first thing to do is to make a list of the martial arts schools within a reasonable distance from your home. You may want to highlight schools of a preferred style (if you have one). Then make an appointment to watch class, and if the school offers a free introductory class, TAKE IT…AND THEN…HERE’S WHAT TO LOOK FOR…. Many “modern styles” have been made up by practitioners of the martial arts, who have taken bits and pieces from different styles and added in some of their own improvised techniques. Much of what is taught in these styles is not part of an integrated system. Consequently, there may be serious gaps in the techniques, and, as a result, the techniques may be unreliable in a “real” situation. Furthermore, because no license is required to teach martial arts in the United States and because there is no regulatory authority to which you can file a complaint, dishonest characters may take advantage of this situation to earn a few dollars. They may even have a criminal record, little or no education, and even less authentic martial arts training. They may look tough, act tough, demand respect and appear to be “good” fighters. However, authentic, traditional martial arts incorporate a value system, which goes beyond mere fighting techniques. True martial arts instructors are genuinely respectful and respected by their students, and they instill these values in their students. They are caring and compassionate individuals, who want to help you to grow and to realize your potential. You will find that a truly authentic teacher will not even speak badly of others schools or other styles of martial arts—and the students are taught these values. “Halls of Fame” have been cheapened in the martial arts world. They can be bought into for the price of filling out a so-called “nomination” form and paying a small fee. Countless “Martial Arts Halls of Fame” have been created to give an air of authenticity to the unsuspecting public, and one who does not know one Hall of Fame from another may be impressed by the certificate only. The original—and considered by many to be the most prestigious and authentic martial arts Hall of Fame—is Black Belt Magazine’s Black Belt Hall of Fame, which was founded in 1968. The attitude of both the instructor and the students can serve as an accurate indicator of school spirit. It goes without saying that the instructor(s) should treat their students with respect, but just as important is the students’ attitude toward their instructor. The students’ respect for their teacher and their own training should be natural not forced. They should feel comfortable going at their own pace, while demonstrating an eagerness to learn and discipline themselves. In other words, the show of respect and discipline should not be a facade. True instructors earn respect from their students—not demand it. Since it’s essential to warm-up before a martial arts workout, so you don’t injure yourself during the practice of techniques, there should be adequate warm-up exercises and a short “cool-down” workout after each training session. If the school invites students of all ages and all abilities to attend classes together, make sure that the instructor(s) are skilled and comfortable teaching the different age groups and skill levels. Even though, eventually, a highly trained martial artist can transcend size and weight in executing techniques, initially, students should be paired with partners of similar size and weight. Make sure students are encouraged to work at their own pace and that the instructor does not force the students to train in a way that they feel uncomfortable. Also, if the school has large class sizes, make sure individual students are getting adequate attention to make good progress. Ask if the school is a “full-contact” or “non-contact” school. During the practice of techniques and sport sparring is contact made to the face or torso? Make sure you are comfortable with the training methods and level of contact allowed at the school. Find out the class schedule, as well as the length of each class. Some schools offer 90-minute classes, but most seem to be an hour long. Decide if the duration of the training sessions is comfortable for you. Martial arts schools come in all sizes. Some are part of a large chain, others are small operations run by a single instructor. Remember…the most important consideration is the instructor and the quality of the instruction. Although large schools may have better equipment and a nicer facility, smaller schools offer students more personal attention from the instructor(s). Look at both types during your research. Either way, you will find a clean school is a sign of pride and respect. Rarely do martial arts schools advertise their price of instruction. Prices could be determined on a monthly basis, over several months, or by how often you train each week. In some cases, the price may vary depending on how many people will be taking classes with you (family package deals, for example). Be aware that some schools require you to sign a contract committing to several, non-refundable, pre-paid months, while others allow you to choose your level of time commitment to training. Make sure you are clear about the cost of studying at each school, and whether your monthly fee includes unlimited classes or a set number of classes per week. All of this may sound like a lot of work simply to find a place to take martial arts lessons. But, if you are planning to invest hundreds of dollars and hundreds of hours in martial arts classes over the next few years, you want to be sure of what you are getting in return. Keeping in mind what is your purpose in training, i.e. mental and physical discipline, developing confidence, physical fitness only, competition, concentration, balance, a feeling of inner harmony, etc…visit each of the prospective schools. If you look into things you feel are important, you will find that your choices are quickly narrowed. Before long, you will be studying martial arts at a school that is right for you. and lives in upstate New York.